The Supreme Court said on Friday it would hear a plea at the start of next week that seeks to postpone the government's annual budget, due to be delivered on Feb. 1, until after five forthcoming state elections are held. 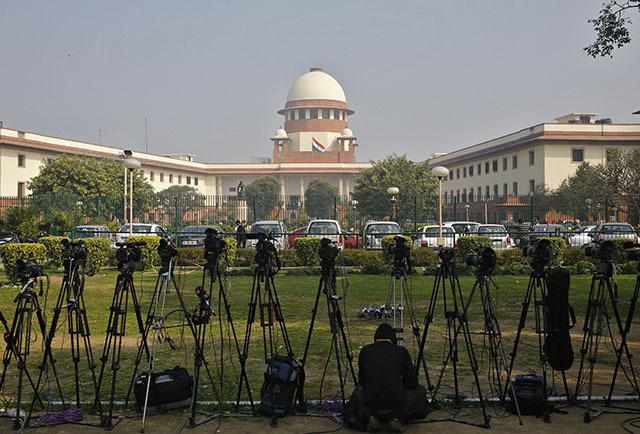 The Public Interest Litigation (PIL) calls for the delay over concerns that Prime Minister Narendra Modi's government could seek to influence the outcome of the polls with populist spending promises. Election rules in the world's largest democracy do not allow governments to offer such giveaways. Modi's government announced last autumn that it would deliver its budget a month earlier than usual, in a move to pre-empt the polls. Modi's Bharatiya Janata Party needs in particular to do well in Uttar Pradesh, a battleground state with a population of more than 200 million that, were it a country, would be holding the biggest election in the world this year. "The budget should be presented in April. The government should not release it in February, as the state elections are starting soon," said lawyer M.L. Sharma, who filed the deferment plea earlier this month. Sharma said the central government should be restrained from declaring any relief for the poll-bound states in the budget until voting is over, as they would violate the Model Code of Conduct (MCC) that governs India's elections. Uttar Pradesh will vote in seven phases starting on Feb. 11 with Modi's party, which swept the state in the 2014 general election, seeking to oust the ruling Samajwadi Party in a contest vital to his chances of winning a second term in 2019. The election round will kick off in Punjab and Goa on Feb. 4, followed by Uttarakhand and Manipur. Results in all five elections will be announced in mid-March. A Supreme Court bench, headed by Chief Justice J.S. Khehar, will begin hearing the case on Monday, but it is not clear how quickly it will deliver a ruling. The finance ministry started printing the budget documents on Thursday.